Altar servers assist the priest and deacon at liturgies by carrying the Cross and Candles during the entrance procession. They also assist in receiving the gifts, assist with incense and holy water, and take the Chalice and sacred vessels for Mass to the Altar. 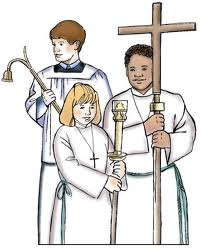 At Holy Rosary Parish children wishing to become Altar Servers must be in GRADE 4 OR HIGHER.